This morning we began with an early breakfast at the Denny’s Restaurant at the hotel. 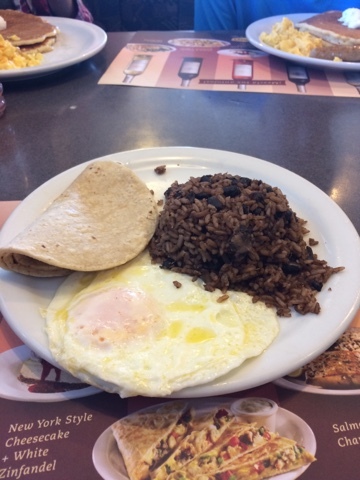 Not wanting to waste another minute eating pancakes and sausage, I went with the authentic “gallo pinto” for my breakfast. Gallo pinto is basically seasoned rice and beans with red pepper. 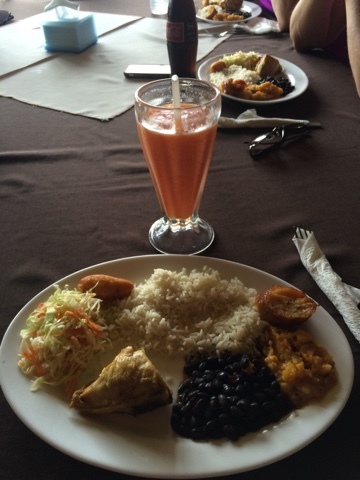 It is served at nearly every meal in Costa Rica. I had mine with three warm corn tortillas and a fried egg. It was a great hearty start to our day. 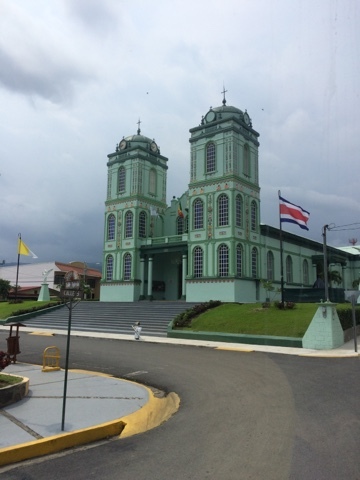 We said goodbye to San Jose (for now) and headed to the Poás Volcano. 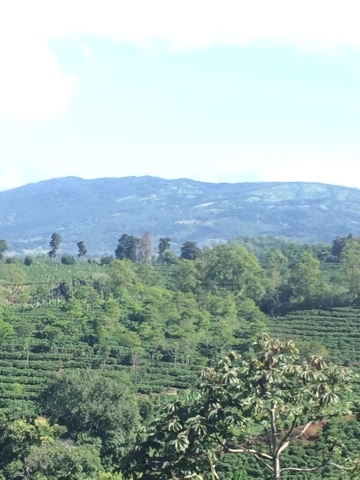 Along the way, we drove past several beautiful coffee plantations. Rafa shared a lot of great information with us about the Central Valley of Costa Rica. The 4 largest cities are located in this area and many experts claim that they did it all wrong when settling Costa Rica. Instead of putting the plantations and farm land in the Central Valley where the soil is most fertile, the first settlers put the largest cities here making the land unavailable for crops. Of course, in hindsight everything appears in 20/20 vision, but it does make you wonder what Costa Rica would be like if all the cities were along the coast and the main agricultural land was inland. 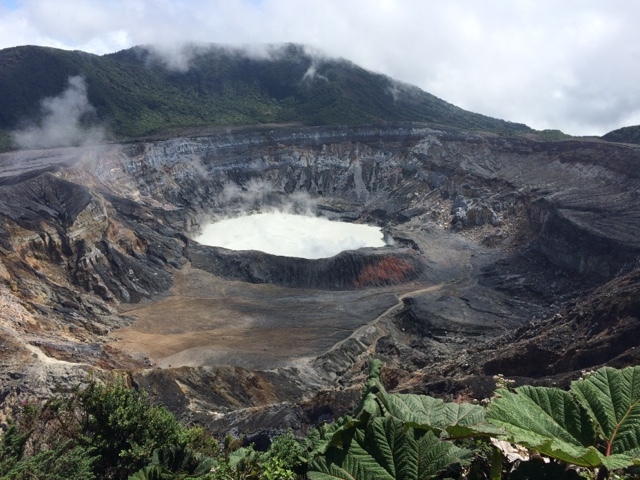 We spent about an hour at the Poás Volcano area. We were lucky that the clouds were not present when we arrived. 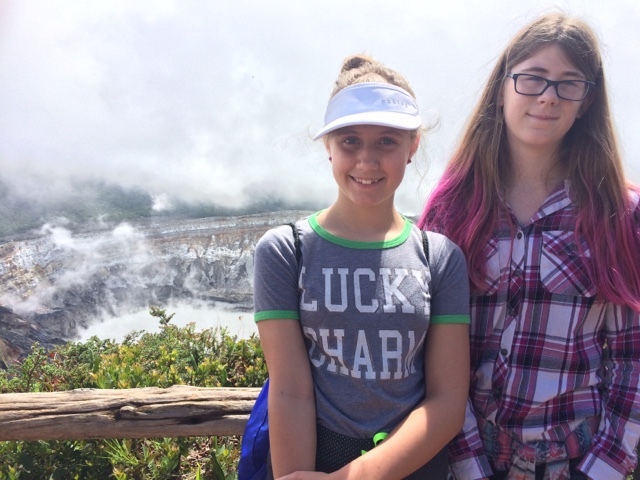 We were able to see the crater clearly. The pH level of the water in this lake is 1 which apparently is the equivalent of battery acid. It was far away from us and is a mile from one side to the other. The weather was nice today and the view was spectacular. I was worried because the rim of the volcano is above the frost level and it can be quite windy and cold at the viewing platform. Fortunately for us, it was clear and warm! 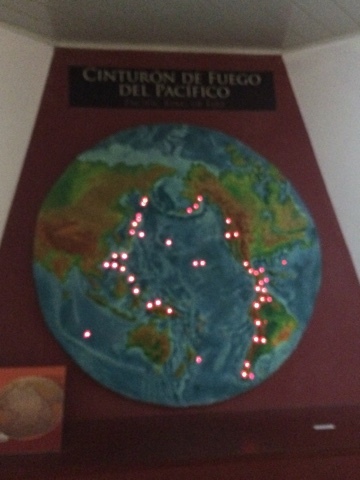 Costa Rica has 7 active volcanos and is located in the Pacific Rim of Fire as shown on this map in the information center at Poás. After leaving Poás, we stopped at a roadside fruit market. 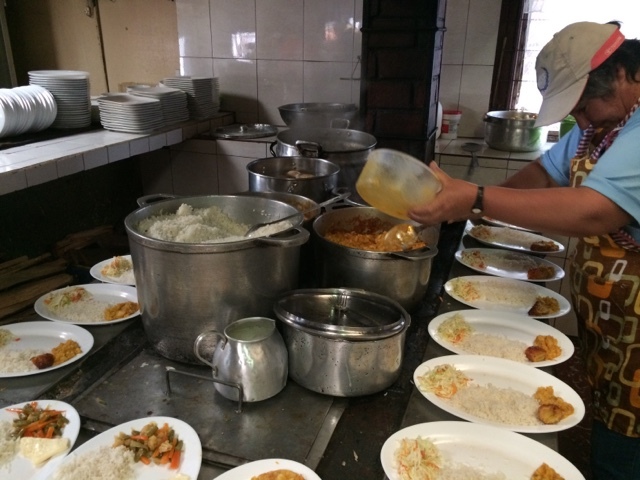 The area on the way to and from Poás is populated by small family-owned restaurants and markets. 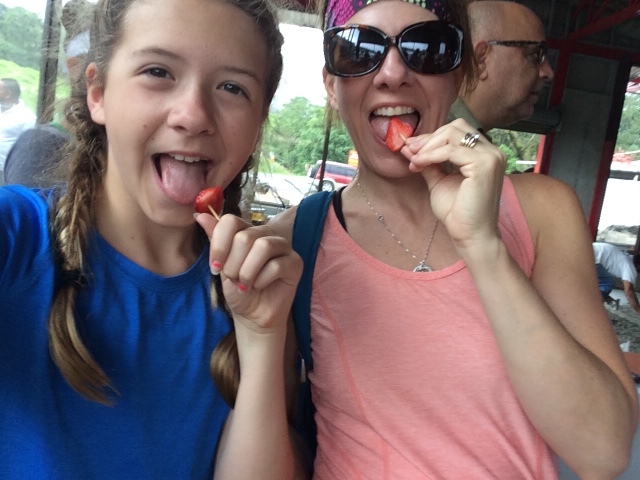 Strawberry crops are plentiful here year round so we were thrilled to be able to stop at a local farm stand to try fresh berries. They were delicious! We also sampled some coffee as well. 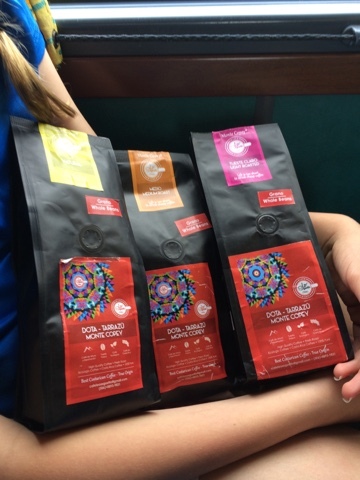 I was talked into buying three packages of coffee beans (great gift) by the nephew of the store owner. I can’t wait to try them back home! I got a variety of beans so that I can sample a little of everything. I have to admit that after trying a few cups of Denny’s house blend, I’m a bit hesitant to try my new dark blend at home. 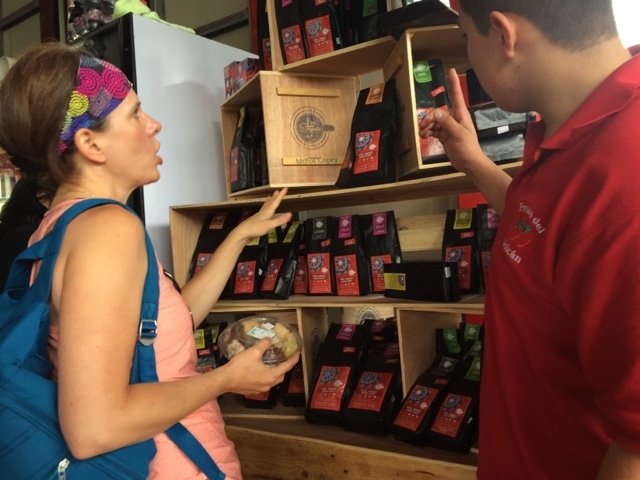 Coffee here is delicious and packs a much deeper punch than what we usually drink at home! 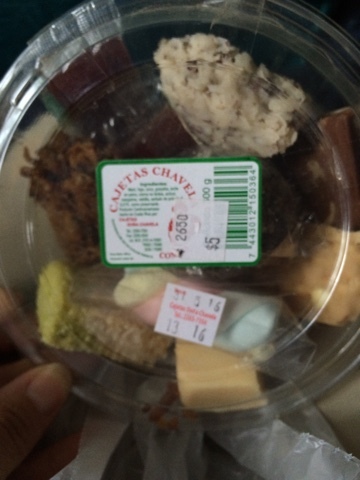 We also purchased some local candies to sample at the hotel later tonight! Perhaps the highlight of the day was our lunch at this family-owned restaurant. How many of you would pull over and stop with your families and eat at a place that looks like this? I know I would have a hard time talking my husband into eating here which is why I’m so glad that someone else did the planning for this trip. This place was amazing! It started with this cute little “open” sign. Next up was a tour of the kitchen where I conversed with the ladies about the types of foods being served. The large pot contains plain white rice. The other pots contain fried yucca, smashed potatoes, black beans, beef stew, chicken, plantains and cabbage salad. I chose to have mine with papaya flavored agua fresca. I didn’t even ask about the water quality because most of these places cater specifically to US tourists and also because I don’t ever turn down anything with fresh papaya. Ever. I will take my chances. Plus I came with medication, so I feel armed. Our dessert, if you can call it that, was a sweet corn tamale. 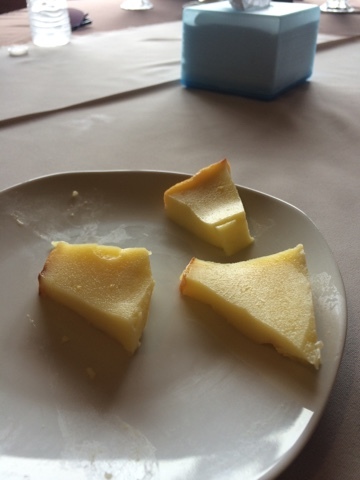 It tasted like a creamy, grainy cheesecake bite. Nothing too incredible. You know how I feel about desserts in Mexico and I’m starting to feel the same way about desserts in Costa Rica. They just don’t do them too well. When you have mangoes falling off trees and pineapples growing in your yard, I guess you don’t need to bake things. 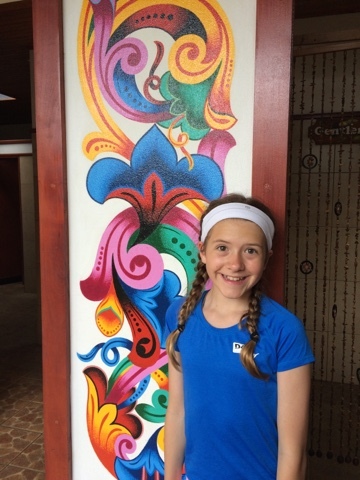 After leaving the restaurant, we started our trip to Sarchí to see the oxcart factory. 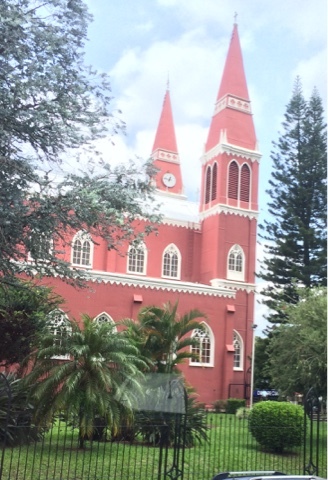 On the way, we briefly passed through the town of Grecia where this church, built completely from metal, was located. 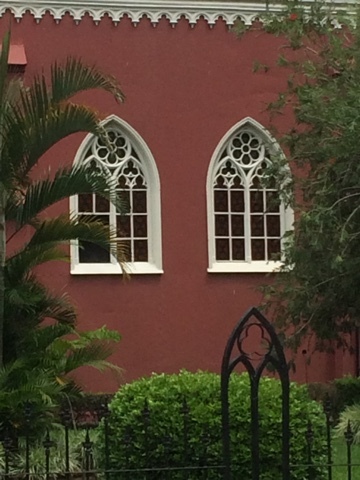 It was built to withstand the trembles of earthquakes. It was beautiful. I wish we had time to see the inside. I bet the acoustics are interesting. 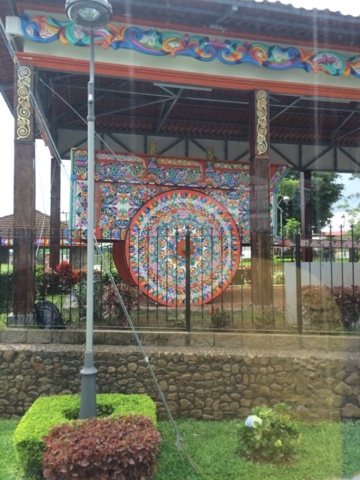 The oxcart is a national symbol of Costa Rica. 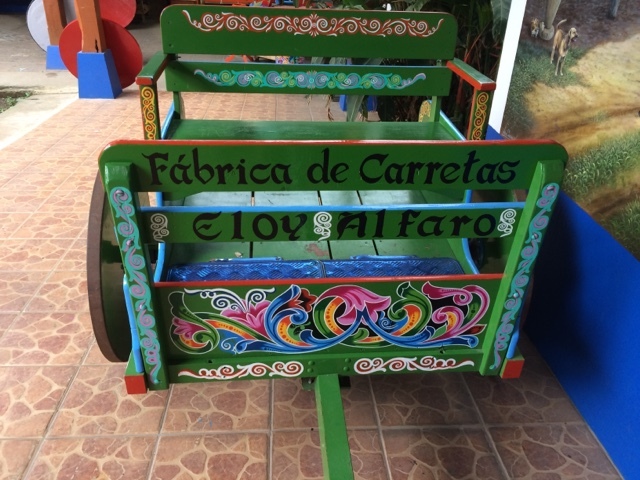 The most famous oxcart factory is La Fábrica de Carretas Eloy Alfaro in the town of Sarchí. The image below is the beautiful church in the town square and the second photo is the largest oxcart ever made which is also located in the town square. The factory is still an active oxcart production studio. It runs on hydro-power. There is no electricity in the factory, but the attached store does have power. 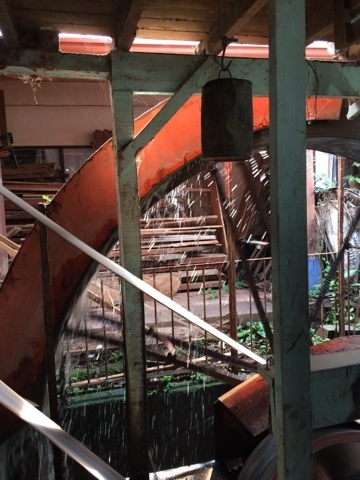 We were able to see the area where the wheels are made. 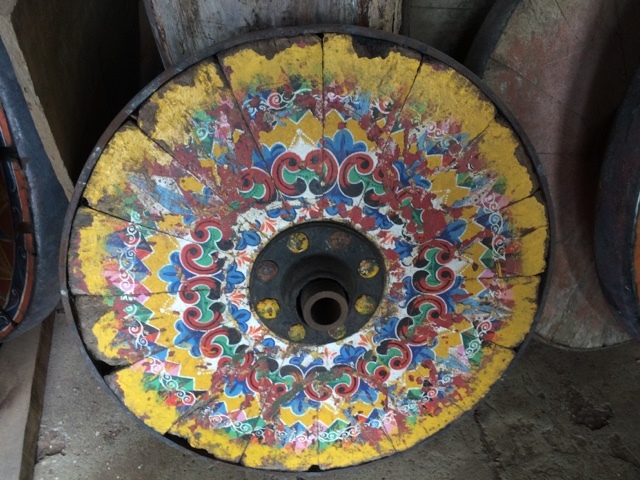 They are made from 16 pieces of wood (usually mahogany) that can each be replaced individually as the wheel deteriorates. This saves hundreds of hours as opposed to having to take a cart out of commission for a broken wheel. The oxcarts are still used today to transport coffee beans. They are each painted by hand by a local artist. 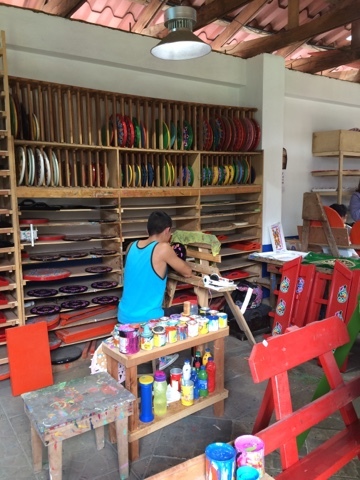 We watched two artisans as they painted oxcart replicas and souvenirs. 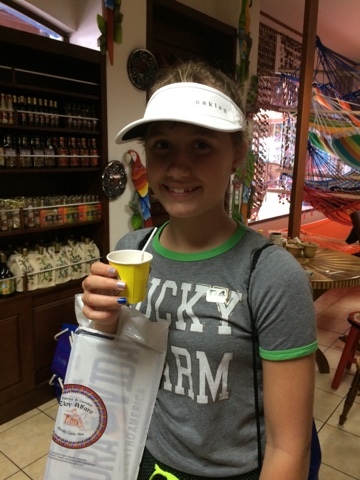 Inside the factory store, we were able to shop for lots of fun souvenirs. 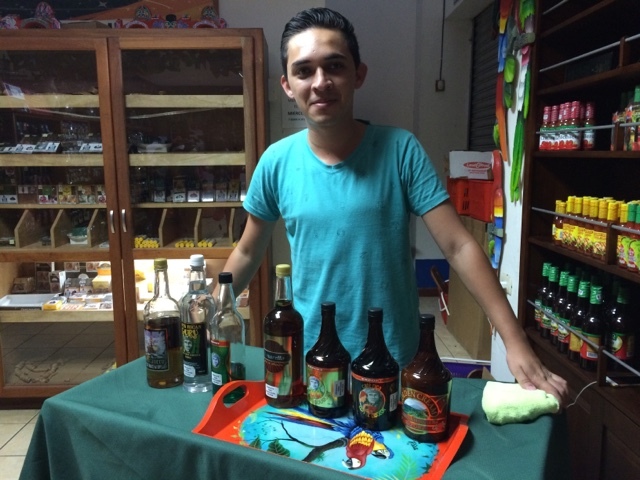 This gentleman was giving out tasting samples of many of the local liquors. I will admit to sampling the coffee cream and the orange flavors. They were delicious and strong! Thankfully, we have our faithful driver Elmer to drive us on our journey! Some of the kids decided to try their first cup of coffee in the shop. I think they were a little surprised by how strong and bitter it tasted. 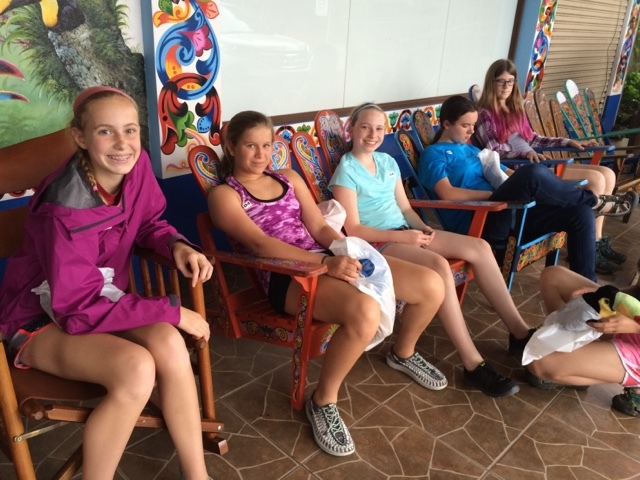 Resting in front of the store on some beautifully decorated chairs. 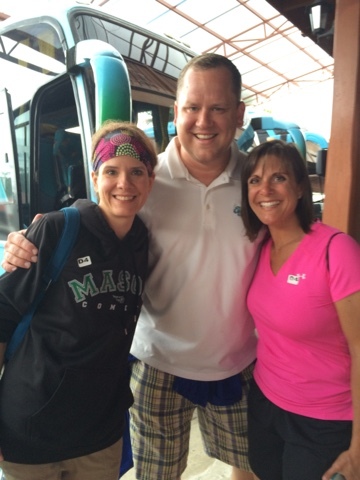 Chaperones unite before the long, windy bus trip to La Fortuna. 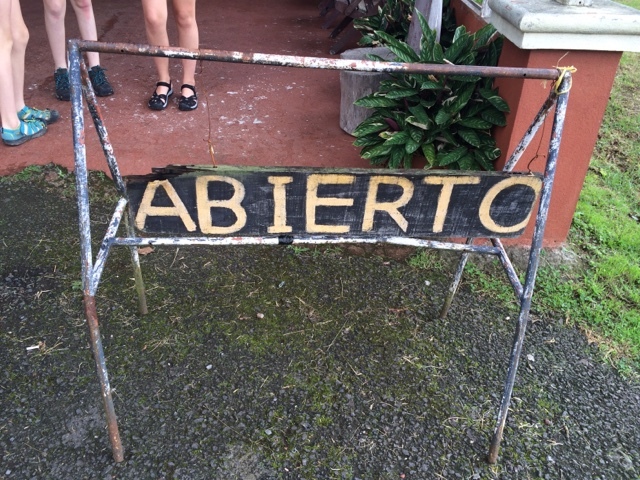 Around 2:30, we boarded the bus to go to La Fortuna which is a tourist town at the base of the Arenal Volcano. 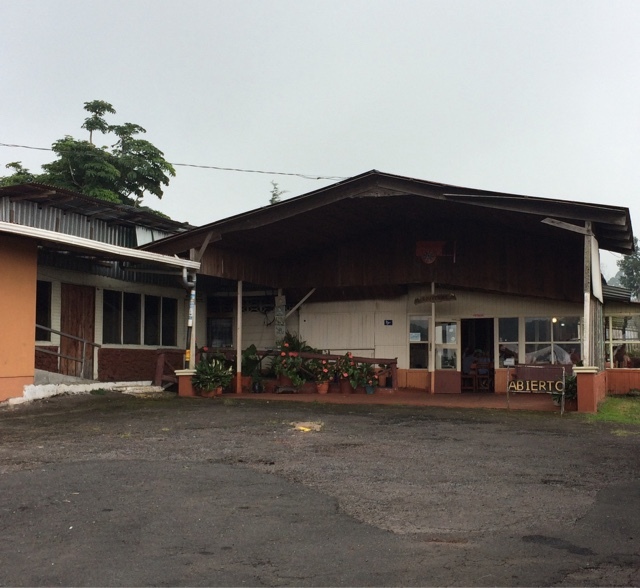 Arenal is a region that has something for everyone. We will be spending two days there going kayaking, hiking in a hanging bridge area, soaking in the hot springs and more. 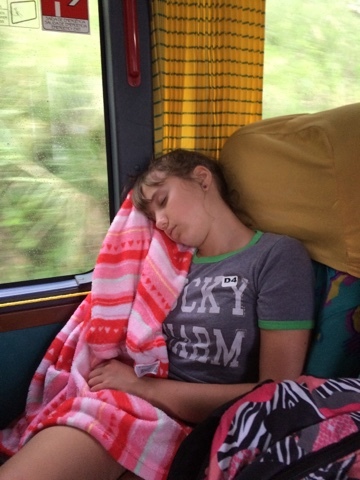 The ride to La Fortuna was exhausting for all involved! After arriving at our hotel, we quickly checked out our rooms and then made our way to My Coffee Restaurant for our dinner. Our choices were chicken and rice, quesadillas, nachos or patacones. I chose the patacones and was not disappointed. Patacones is a local dish which is basically a twice-fried plantain that serves as a base for beans, cheese, guacamole and pico de gallo. They had me at guacamole. It was the holy grail of tastiness. I enjoyed a cup of coffee after my meal before returning to the hotel for the night. We are staying at the Hotel Arenal Montechiari. It was raining when we arrived and is dark now as I’m typing. I hope to have more to show tomorrow when the animals wake up and the sun is shining. 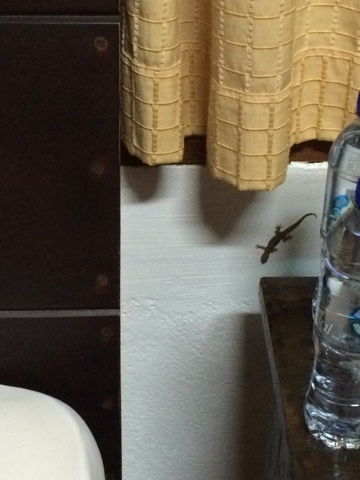 For now, I’m going to tuck in my gecko and hit the sheets.